The research focus of the group is on understanding the structure of the most fundamental building blocks of matter. The instruments required to shed more light on the origin of the structure of elementary particles and their masses are huge. Members of the group perform measurements using data collected with the Compact Muon Solenoid (CMS) experiment at the Large Hadron Collider (CERN). Enormous amounts of data are needed to find out more about this most fundamental question. Amongst all elementary particles the top quark is the most special quark with a mass close to that of an entire gold atom. Our current understanding is that the Higgs mechanism gives mass to the top quark. The measurements of the group are employing data enriched in top quarks (and also Higgs bosons) to study very precisely the special connection between those two fundamental particles and to search for any evidence of contributions beyond the Standard Model. We are also involved in Research and Development for novel silicon pixel detectors and low mass support structures. This research involves cutting edge materials such as carbon fiber, carbon foam and light-weight Aluminum alloys for example Aluminum Carbon fiber. The in-house Purdue Silicon Detector Lab, or PSDL, allows to produce and build support structure prototypes and silicon detector modules. We perform thermal simulations and comparisons to data taken with a CO2 cooling setup, and we collaborate for this research with Cornell, Fermilab, CERN, and other institutes in the US, Europe and world-wide. I am currently teaching course 431 "Electricity and Magnetism II (Honors)" in fall semesters and course 219 "General Physics II" in spring semesters. 219 "Electricity, Magnetism, Optics and Modern Physics ", Spring 2018. 431 "Electricity and Magnetism II (Honors)", Fall 2017. 219 "Electricity, Magnetism, Optics and Modern Physics ", Spring 2017. 431 "Electricity and Magnetism II (Honors)", Fall 2016. 431 "Electricity and Magnetism II (Honors)", Fall 2015. Dissertation on "Measurement of the D* Meson Cross Section and Extraction of the Charm Contribution, Fc2 (x,Q2), to the Proton Structure in Deep Inelastic ep Scattering with the H1 Detector at HERA", Jan 2009, University of Heidelberg. ﻿Diploma on "Commisioning of the third level of the Fast Track Trigger for the H1 experiment", Oct 2004, University of Dortmund. 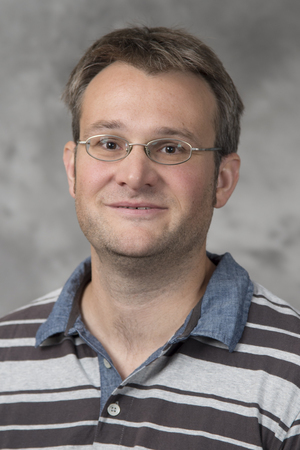 Assistant Professor at Purdue University involved in the CMS experiment, since Aug 2015. Postdoctoral Research Associate at Fermilab involved in the D0 and CMS experiment, Jan 2010 - Aug 2015. Postdoc at the U Heidelberg involved in the H1 experiment, Jan 2009 - Jan 2010. Full 3 year Ph.D. scholarship by the German Research Society within the "International Research & Training Group (IRTG): Development and Application of intelligent detectors", 2004-07. Convener of the CMS Inner Tracker Mechanics group, since 2017. Convener of the CMS Top quark properties sub-group, 2015-2017. Convener of the combined D0 top - Higgs - electroweak group, 2012-2015. V.M. Abazov et al., "Measurement of the inclusive tt production cross section in pp collisions at √(s)=1.96 TeV and determination of the top quark pole mass", [Phys. Rev. D 94, 092004 (2016), arXiv:1605.06168]. S. Camarda, ..., A.W. Jung et al, "QCD analysis of W- and Z-boson production at the Tevatron", [arXiv:1503.05221]. V.M. Abazov et al., "Precision measurement of the top quark mass in lepton+jets final states at D0", [Phys. Rev. D 91, 112003 (2015), arXiv:1501.07912]. A.W. Jung, "Review of recent measurements in the top quark sector at the Tevatron", [Mod. Phys. Lett. A, Vol. 29, No. 18 (2014) 1430014S, arXiv:1404.1842]. V.M. Abazov et al., "Measurement of the differential ttbar production cross section on ppbar collisions at √(s)=1.96 TeV with the D0 detector", [Phys. Rev. D 90, 092006 (2014), arXiv:1401.5785]. A.W. Jung, M. Schulze and J. Shelton, "Kinematics of Top Quark Final States: A Snowmass White Paper", [arXiv:1309.2889]. V.M. Abazov et al., "Search for Violation of Lorentz Invariance in Top Quark Pair Production and Decay", [Phys. Rev. Lett. 108, 261603 (2012), arXiv:1203.6106]. A.W. Jung et al., "Longterm Operational Experience with the Silicon Micro-strip Tracker at the D0 Detector", [arXiv:1202.5996v1]. A complete list of my publications is available via INSPIRE.